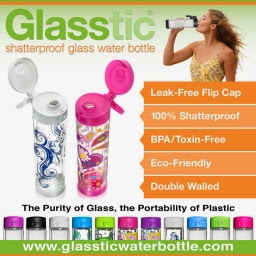 We had the opportunity to facilitate review for a Shatterproof Glass Water Bottle by Glasstic . Have you ever worried that there might be dangerous health risks from drinking beverages and eating food out of plastic? I knew you shouldn't heat up certain plastics with food in them. Awhile ago, I was reading an article online, suddenly I was very worried about the plastics my family was eating and drinking from. The article advised to look on the bottom for a number, such as #2, #4, and #5 are plastics that should be okay. The risks with these numbers should be low enough to be a non issue. It is advised to never use #3 because of Bisphenol A and Phthalates- both of which are endocrine disruptors. BPA (Bisphenol A) and Phthalates can leech from plastic containers into food and beverages. Exposure may lead to development and reproduction issues, as well as adverse effects on the liver and kidney. I decided that instead of worrying about numbers with my drinking containers, I would just drink out of a glass container. Should we really risk it when they say some numbers "should" be okay? It was a mason jar for me, until I had this great opportunity to review a glass bottle from Glasstic. Glasstic bottles are a 16 oz. shatterproof glass bottle designed with a glass inserted in the inside of a BPA-Free plastic outer shell providing durability and containment, This durable outer shell also protects the glass bottle against breakage. Between the glass and the plastic is a double layered protection that provides for total condensation protection and some additional insulation for your beverage. You will not ruin your wood table! The cap and the base of the glass bottle are also BPA-Free, and well sealed. This glass bottle is well constructed, no matter what type of liquid you fill the glass bottle with, it is leak proof. It has a leak proof flip cap lid and a safety lock to prevent accidental opening and leakage. The Glasstic bottle is not only break resistant, but it is shatterproof. If you drop the glass bottle and it should break, the glass will remain contained in the BPA-Free, highly durable outer plastic. A 3rd party testing firm concluded that the product sustains 6 bottom drops on average before breakage of glass inside PLEASE DO NOT TRY TO DROP OR BREAK THE GLASS BOTTLE ON PURPOSE. You could damage or break other parts of the product such as the handle on the sports lid. I absolutely love the new glass water bottle from Glasstic. I like knowing that it is safe and I do not have to worry about toxins or chemicals. It is really easy to disassemble and wash. I also like knowing I will not have to worry about any disgusting smells or tastes. The glass is 100% recyclable and to me recycling is always a plus. You can purchase the glass bottles is a variety of pretty colors such as, green, pink, blue, black, purple and white. They also offer beautiful designs. GLASStic Bottle Co. is a division of Healthylicious Living LLC.We are a healthy and active lifestyle company, helping people around the world to realize a better quality of health and life through our innovative product line. We knew the ultimate water bottle had to be made of glass. Yet we also know we had to make a glass bottle that was portable, break resistant, shatterproof, BPA free, toxin free and safe over-all to carry into public places. In other words, a worry-free glass water bottle...This was how Glasstic was born. It is our vision to see all of the "No Glass Allowed" signs at the beach, pool, gym, park, school, event, everywhere...be replaced by signs that say, "Only GLASStic Allowed". A revolution in beverage containers, the purity of glass...with the portability of plastic...GLASSTIC.